Back to the early 1990s for today’s edition of Picture in Time as we take a look at a Brush Car which looks very different today – 633. Brush Railcoach 633 originally entered service in August 1937 and of course today has been converted into the Illuminated Trawler (the tram was withdrawn in 1997 with it completed in time for the 2001 illuminations). 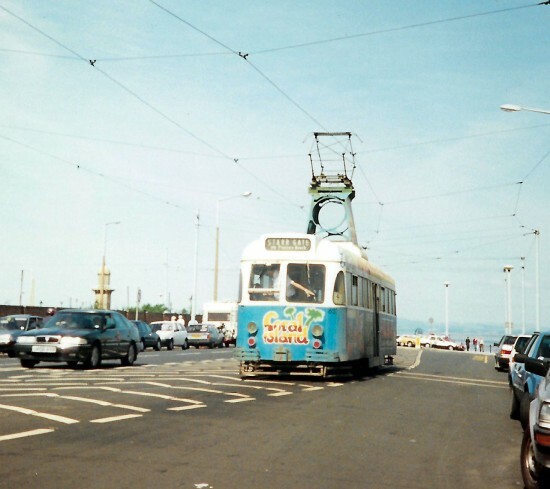 At the time this photo was taken – which was either in August 1992 or October 1993 – it was in an all over advert for Coral Island with a simple half white and half blue design with signwriting for the attraction on Blackpool Prom. The location is the unmistakeable Fleetwood Ferry.